Latin Touch Meat Guides Beef: Part Three - Latin Touch, Inc. In our first beef guide post, we took a look at serving sizes, and common beef definitions. In part two, we moved on to some of the best steaks for grilling, proper meat temps, and a whole bunch of tips for the perfect steaks over your caja china. Now, it's time to think inside the box and take a look at the best cuts of beef for slow roasting and classic BBQ, and how to roast and smoke them. Smoking is a low and slow cooking style, most closely associated with American style BBQ, that uses hardwood smoke as an ingredient for flavoring and tenderizing meat. Many consider smoking to be as much an art form, as a cooking technique, and your La Caja China is an ideal vessel for perfect smoky BBQ. Depending on the cut of meat, BBQ cook times can take up to 20 hours, with temperatures seldom rising about 250F. This slow cooking process breaks down the fibers and collagen that make these cuts of beef tough, and transforms them into gelatin, creating an unctuous, buttery tenderness, and give the smoke time to really soak in, and add its unique flavor to your beef. 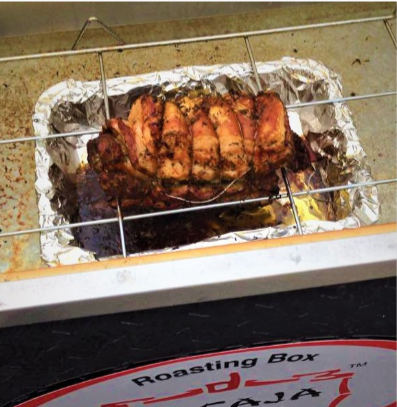 There are a number of methods for adding smoke to your meat in La Caja China. Two of the most popular are The Smoke Pistol, and the A-Maze-N Smoker. Brisket is a large roast, cut from the shoulder of the steer. It’s considered a classic of the BBQ arts and, in states like Texas, it’s consider THE meat for BBQ. An exceptionally tough cut, it really benefits from long, slow cooking. Roast or smoke to 160F, wrap the whole brisket in heavy foil, and continue cooking to 180F. Remove from heat and let rest (still wrapped) for at least an hour before cutting. Slice into pencil-thick slices, across the grain. This is the classic Christmas, or Sunday roast in many parts of the world. The fine texture and generous marbling make ribeye roast a delicious and forgiving cut. A lean, boneless cut, the sirloin tip roast is a favorite for thin-sliced beef recipes like pit-beef, French dip, and cheese-steak. Roast it, with or without smoke, and slice it as thinly as possible (chilling it first, helps) for some of the best beef you’ll ever taste! Roast to 140°F for medium rare; 150°F for medium, and let rest at least 20 minutes. If you’re going to chill it, before slicing, allow the roast to rest at least an hour, slice in half, and wrap each half tightly in plastic wrap, before placing them in the refrigerator overnight. Moving the roast to the freezer for 15-20 minutes before slicing, can make it even easier. Slice meat thinly against the grain, and reheat in warm au-jus or gravy, depending on your recipe. Be sure to check out the Latin Touch Blog, for more of my favorite beef roasts, and brisket recipes!